For punters looking for value in the Australian Open betting market, Nadal’s illness couldn’t have come at a better time. Nadal’s defeat in the semi-finals of the Doha ExxonMobil Open last week to Nikolay Davydenko has seen the Spaniard switch places with Roger Federer at the top of the market. Federer is in to 7/4 from 9/4 after his win over Davydenko in the final in Doha last week and Nadal is out to 9/4 from 7/4 after his exit. 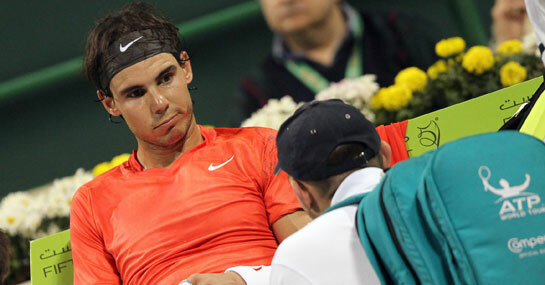 Nadal’s flu bug, and not a loss of form, was the reason he was unable to dispose of Davydenko last week and having spent the following two days after the defeat recovering from the illness, Nadal is now back in training. He flew to Melbourne on Sunday night/Monday morning and held his first practice session earlier today and although it was cut short by the weather, Nadal is fit and fighting for his second Australian open title. While Federer may enter the tournament as the reigning champion, Nadal has won all three of the last Grand Slam tournaments and can become the first male tennis player to win a non-calendar year Grand Slam. Rod Laver is the only other man to hold all four Grand Slam titles at once but he did it over the course of one year and still remains the only male to win a Grand Slam in the professional era. Ladbrokes are offering 10/1 that Nadal wins all four Grand Slam tournaments in 2011 and emulates Laver’s achievements, and as the betting odds suggest, it’s certainly a possiblity. The Spaniard is favoured to win two Grand Slam titles at 15/8, and is 9/4 for just the one win, 3/1 for three wins and 5/1 that he wins none of the 2011 Grand Slam titles. A £25 stake on Nadal winning the Australian Open would return £81.25. A free £25 bet is available for new customers when they sign up here.